You read that right: 100 square feet of canvas hides inside a thick black cover, ready to deploy a generous amount of shade or shelter in a moment’s notice. These are my impressions after four years of enjoying the Manta’s shade from the blazing desert sun, sheltering from storms underneath it, and putting it through tortures that have ripped lesser awnings to pieces. 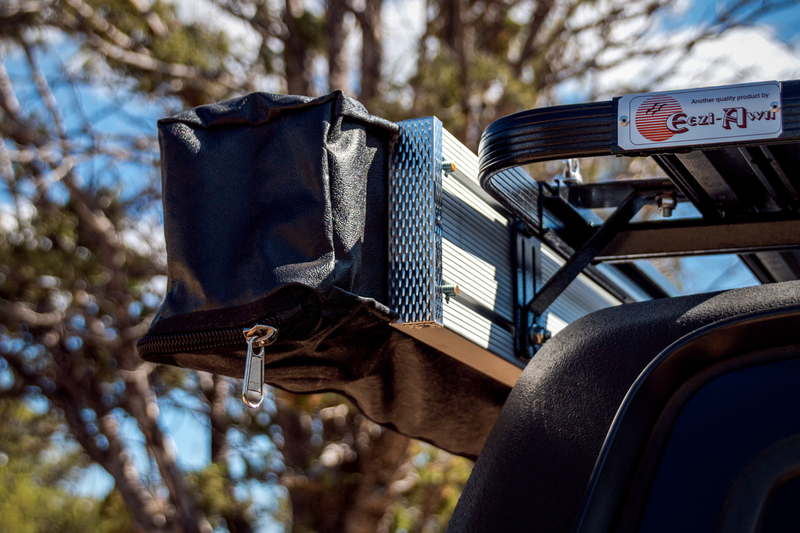 When fully deployed, the Manta’s shape provides a larger than 7-by-7-foot rectangle of coverage off the side of a vehicle or trailer, which wraps around the rear with an additional 14-by-7-foot triangle. 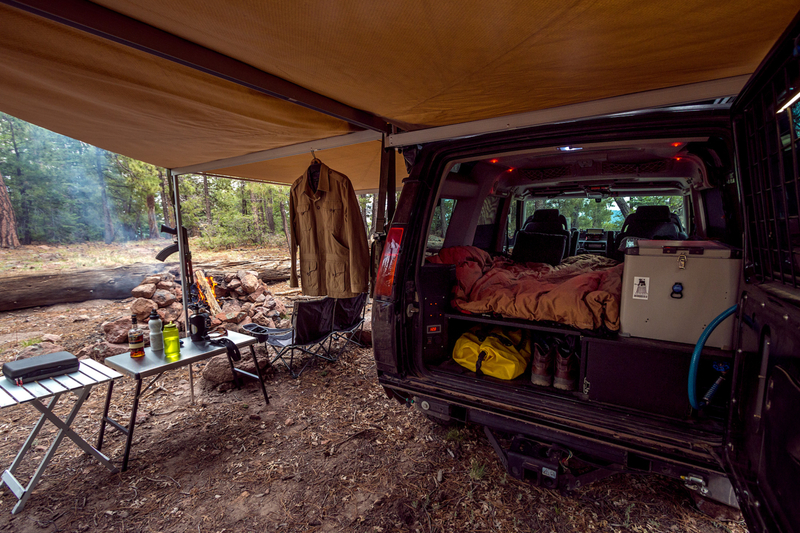 When it’s time to hit the road, the entire mass of sturdy 260-gram waterproof ripstop canvas rolls up into a UV-resistant PVC cover that’s no bigger than an awning half the Manta’s size. The Manta’s chassis is made entirely of lightweight anodized aluminum. Adjustable legs with integrated stake holes recess inside C-channel rafter arms, which pivot away from a stout length of aluminum extrusion on stainless steel hinge bolts. All of this combines to create a structure that is sturdy, lightweight, and highly corrosion resistant, and easily repaired with basic hand tools and commonly available hardware. That’s not to say the awning is easy to damage—quite the contrary as you’ll read below—but I take comfort knowing that if the Manta gets damaged all of it’s components (including the canvas panels) are field-replaceable. The awning can be mounted to most roof racks or even load bars, thanks to standard 8mm hardware that can be placed nearly anywhere along the Manta’s 90-inch frame. 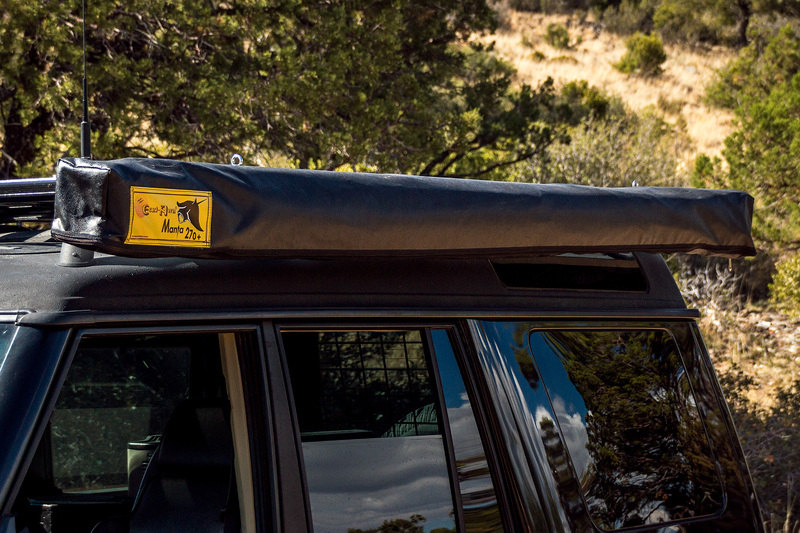 Of course, if you’re running an Eezi-Awn K9 roof rack there is a convenient kit available to match. 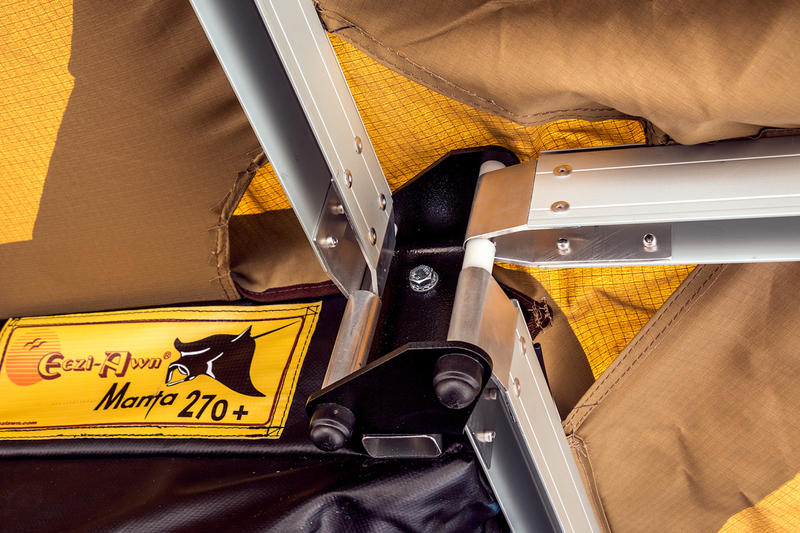 The legs are adjustable in height up to 92 inches, so it sits nicely on even the tallest adventure mobiles. That’s not just marketing hype. The first time I set up a Manta I skipped the directions and took just under two minutes. Today I could do it in 30 seconds, or under two minutes with stakes at all four legs. Teardown—which is the messiest and most time-consuming task with most awnings—is just as easy. Better still, you can pack the Manta away without getting the canvas all up in your face. If you’ve ever covered yourself in the previous night’s dust and campfire ashes you know just how important that is. Of all the awning systems I’ve used, and I’ve used nearly all of them, the Manta is one of the easiest and fastest. 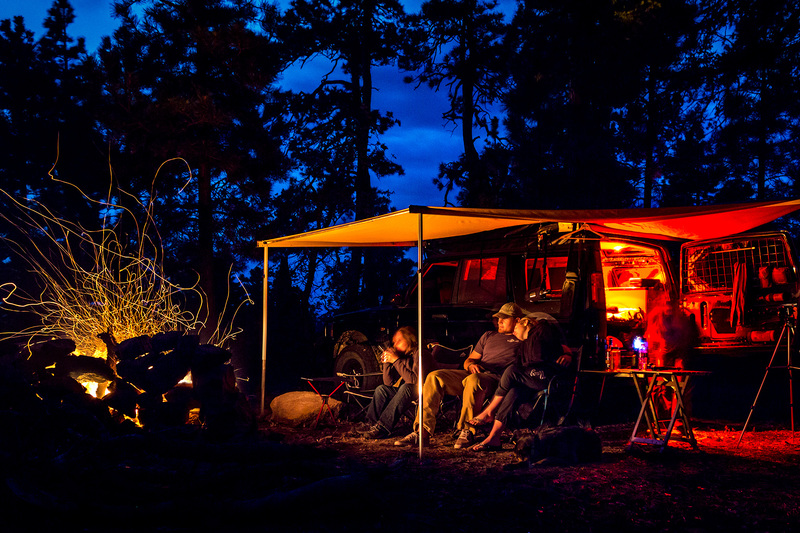 In calm conditions, and even a mild breeze, the awning can be setup or torn down solo. The free-standing nature of the rafter arms and step-by-step deployment of each section means you’re not fighting against 100 square feet of canvas. 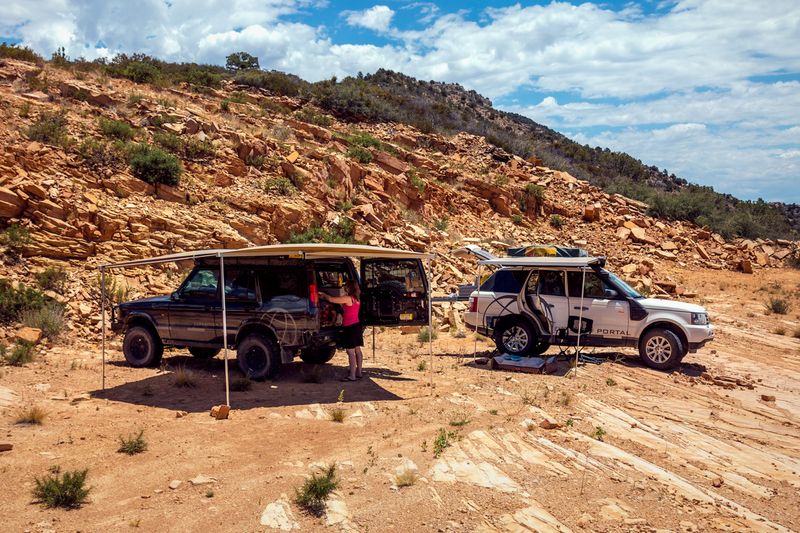 Instead, you simply open and fasten the rectangle section, then walk around the vehicle with the rear triangle section in tow and clip it in place. If it’s windy you’ll just need a second set of hands to hold each section steady while you drop the legs and hammer in the stakes. The Manta does not need guy lines, just two stakes per leg (included). In recent months there’s been a flood of photos hitting social featuring line- and leg-free awnings, and I’ve been asked more than a few times if I’ll be “upgrading” to one of these seemingly-magical new wings. 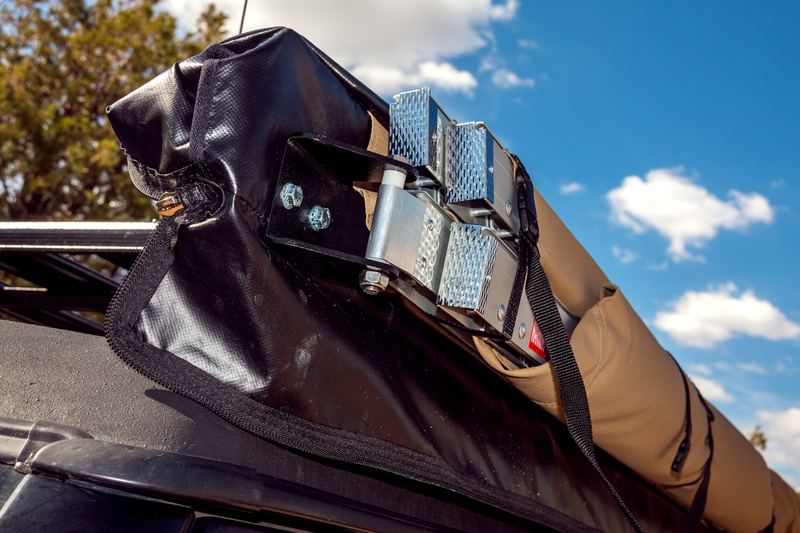 I was amused to walk the Overland Expo campus in May and find that, without exception, all of them had multiple guy lines and anchors per corner to secure against a moderate wind (one even had makeshift legs in place). You can’t cheat physics: if you deploy an awning in the wind it will need to be anchored, better to have support for that anchor built-in from the start. 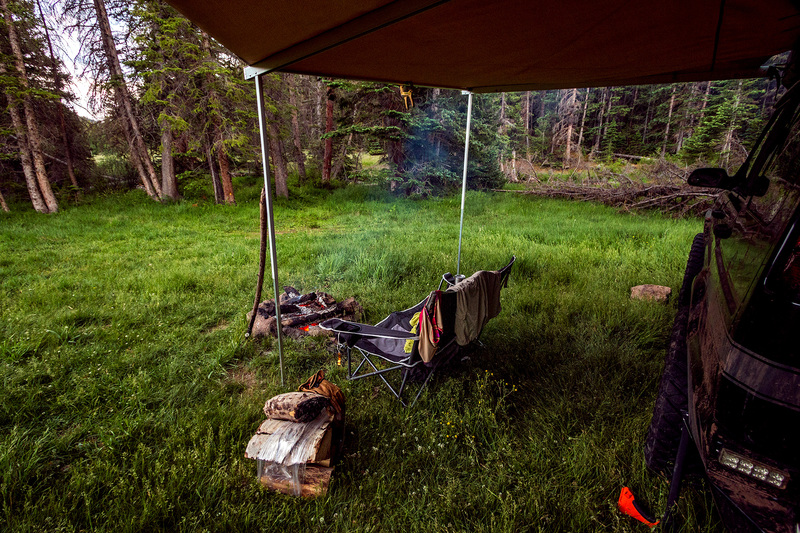 If it’s dead calm using an awning in free-standing mode for a lunch break is nice, but if there’s any wind or if it’s going to be unattended then legs and stakes need to be deployed. There has only been one truly free-standing awning to grace our industry—the Hannibal—which is a heavy-gauge, boxed-aluminum design stout enough to use as an engine hoist (not really, but it is beefy). Impressive as they are, they’re also expensive, heavy, and nearly impossible to find here in the USA. There are numerous spots along the inside edge, outside edge, and near the center of each rafter arm where you can easily slip a hook over a bolt, hinge, or rivet. 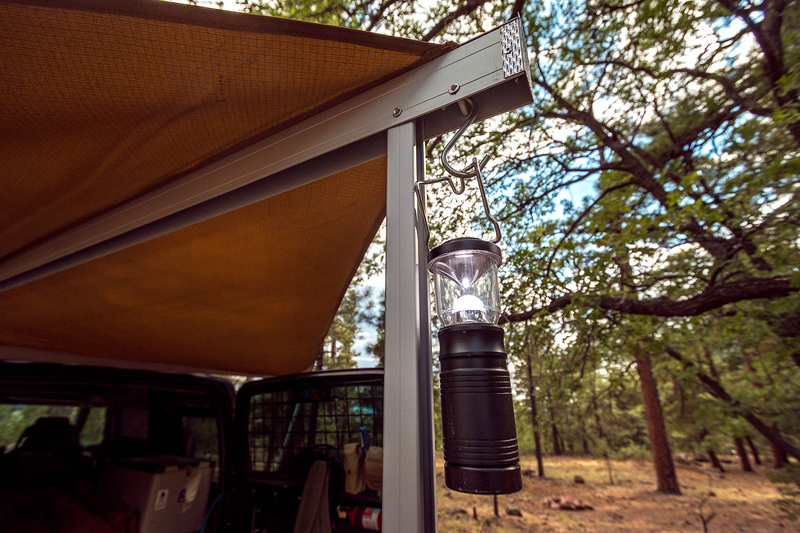 Whether an intentional design or not, these spots are perfect for hanging (LED) lanterns, jackets, hats, towels, or any other lightweight camping gear you need to keep handy and off the ground. Just How Big is a Manta? Big. 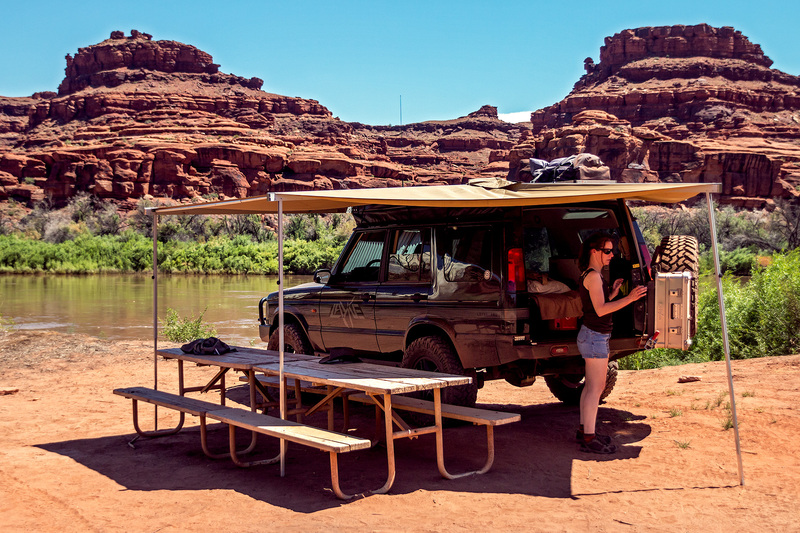 100 square feet is large enough to swallow a pair of standard-issue park service picnic tables and still leave ample room to open doors and provide shade over our slide-out galley—a welcome relief in 110°F July heat on Utah’s White Rim Trail. 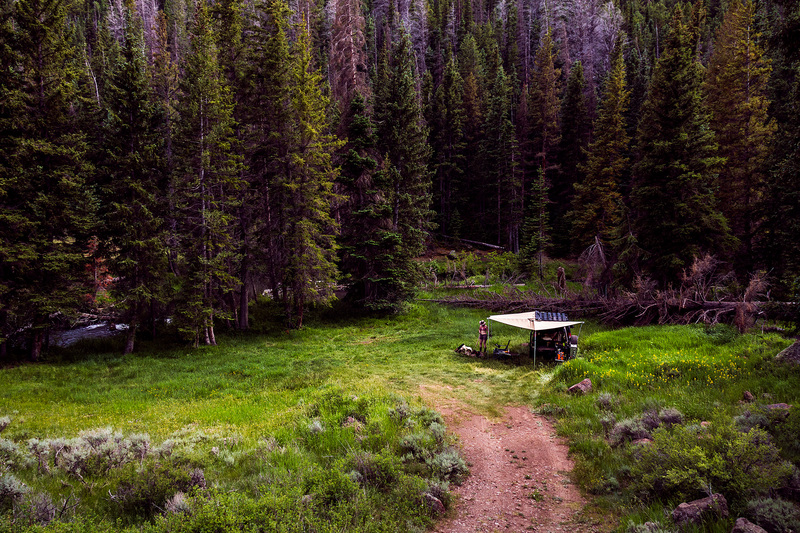 It’s enough room for a group of four to enjoy dinner out of the rain without rubbing elbows, and without putting the stove away first. Remember Overland Expo West 2016 (aka Blowverland Expo)? Our Manta was deployed in the windward corner of our booth during the entire event—with a 50-pound wooden sign hanging from the corner, and tarps clamped to the canvas and legs to keep the rest of our camp from blowing away. The shaft of that American Adventurist flag snapped in the gusts, but the Manta stood firm. I could quote a bunch of technical specs and wind ratings, but a better testament to the Manta’s longevity is the real-world torture testing I’ve put the awning through. On multiple occasions I’ve had it deployed through 40+MPH gusts of desert wind, hidden under it from torrential downpours in the mountains, and even shaken a snow load from it’s panels the morning after a surprise flurry. In transit it’s smacked more than it’s fair share of trees at speed, and held fast to the side of an airborne Discovery through some brutally harsh landings. In four years I’ve had to do little more than wash it and perform basic maintenance, which consists of adding a little dry lube to the legs once a year to keep them sliding smoothly. I’ve done one repair: replacing a single rivet that failed due to my own foolishness. This is an heirloom-quality piece of gear, designed for decades of service. My only complaint with the Manta is that a strap wasn’t included to keep the rear triangle section rolled up while using just the side rectangle. Granted it was never intended to be used this way, but it would be a great feature in tight spaces where wrap-around coverage might be impractical. 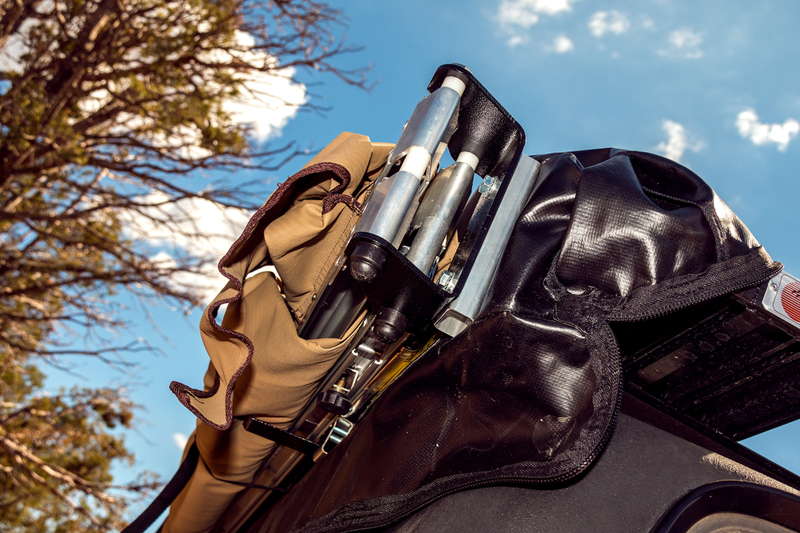 Of course, with a little careful planning a DIY-minded individual could easily add a strap. 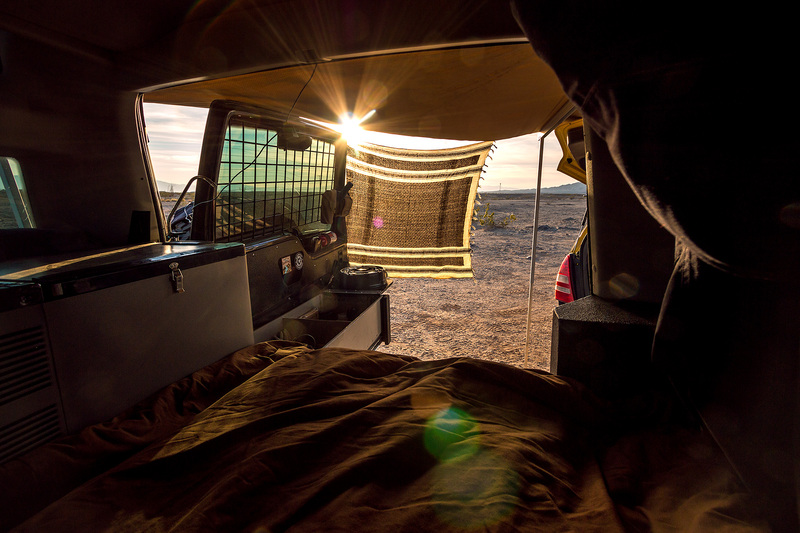 If you are in need of a massive amount of shelter around your vehicle, want an awning that can keep up with the demands of long term real-world use, or are simply fed-up with the hassles inherent in other awning designs then the Manta is where you should look. Want something a bit smaller? Consider the Bat or Swift awnings, both constructed from the exact same components as the Manta. The Bat is a pinwheel shape about 20% smaller, and the Swift is half the Manta’s size (it’s literally just the side-facing rectangle of a Manta). 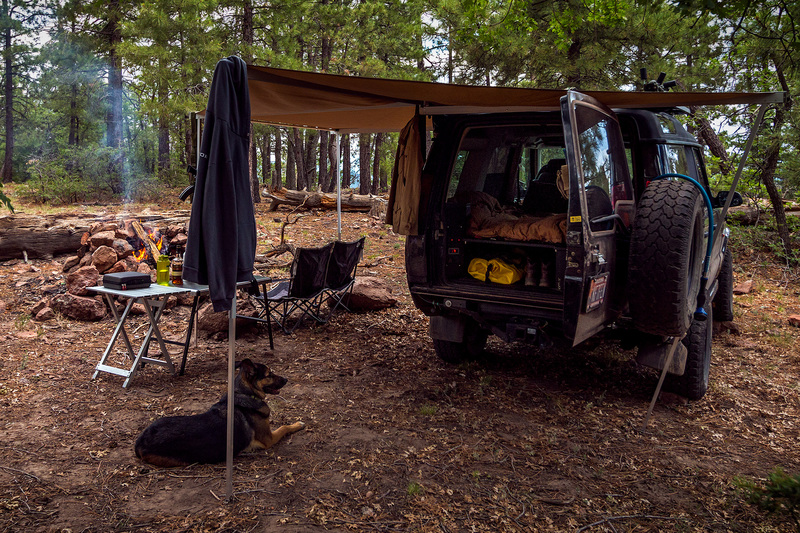 Full specs and current pricing for all three awnings can be found at Equipt, along with integrated wall systems for turning them into cavernous vehicle-mounted cabin tents. Full Disclosure: Equipt (the US importer for Eezi-Awn) is a client of The Layne Studio. 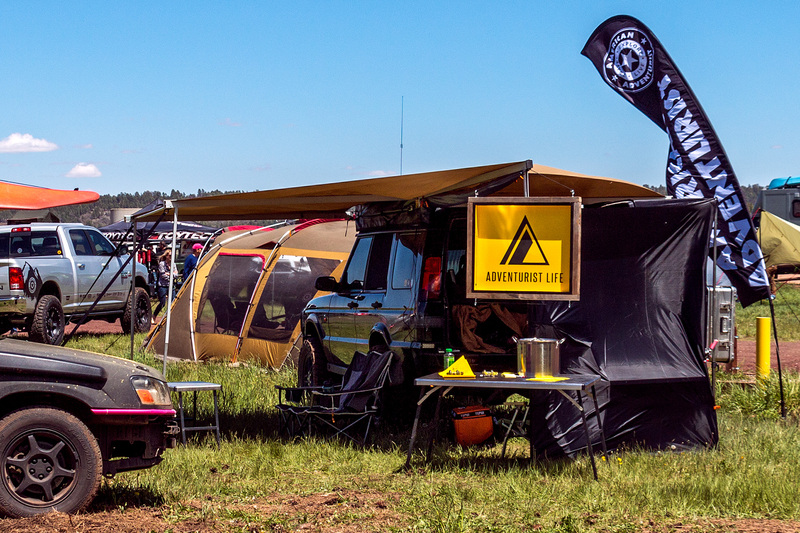 However, my Manta awning was purchased outright with my own funds, and was instrumental in turning me into an Eezi-Awn fanboy and my desire to continue working with them. I’m a designer, photographer, author, and adventurist. I’m the lead creative at [URL='https://layne.studio/']Layne Studio[/URL]. I shoot [URL='https://chazzlayne.com/photography']photos[/URL] for clients in the adventure, automotive, and outdoor industries. I write [URL='https://chazzlayne.com/editorial/']articles[/URL] for travel and adventure publications. I make stuff in the [URL='https://layne.works/']Layne Workshop[/URL]. I’m based out of Prescott, Arizona, but I prefer wanderlust over the comforts of home. I'll never forget the trip to SMR'16 with you and Cordes. We stopped at that shell of a Shell station in the middle of nowhere. You had the Manta deployed and were halfway through your sammich before I'd got the kid out of the carseat and reached the cooler under the sleeping gear in the back of my truck—all in 115° temps with no other shade in sight. Kinda sold since then.